On page search engine optimisation (SEO) is a powerful complement to any large e-commerce site. Online retail competition is fierce and it is vital to your continued success to increase your online visibility. You need to outrank your competitors and SEO can do the trick. Outranking your competitors also means that you get a much larger slice of global e-commerce retail sales. 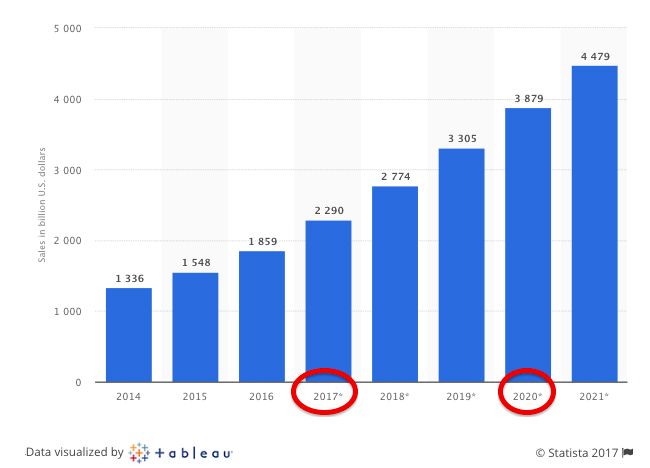 Having a powerful on page SEO strategy will help you get a bigger slice of the e-commerce market, which has been growing at a phenomenal rate as shown in this graph. Last year’s sales have been estimated at $2.29 trillion and that phenomenal figure is expected to reach well over $3 trillion by 2020. A powerful on page SEO strategy can increase your sales by simply placing your products in front of more online consumers. Challenging? Not as much as you may think. In fact, with a few on page SEO pointers, your e-commerce site can start ranking higher in a week’s time. Here are few tailor-made on page SEO tips for exponential growth and success for large e-commerce sites. Structuring your e-commerce site is essential to providing the best user experience while directing your customers to the products they want to buy. User-friendly navigation includes pages by brands, models, item types, colour, and more. To increase your online sales, make sure that your ecommerce site is properly structured to make it easy for users to navigate your online store. It is very easy for large scale e-commerce sites to accidentally produce duplicate content. This is due to the shear volume of product pages needed. But having duplicate content is a definite on page SEO no-no. 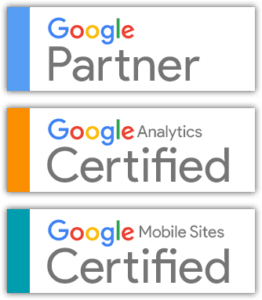 To ensure your site and product pages continue to move toward page one in SERPs you need to identify and get rid of any duplicate content. You can manually hunt down duplicate content or use online tools like Moz crawl test. 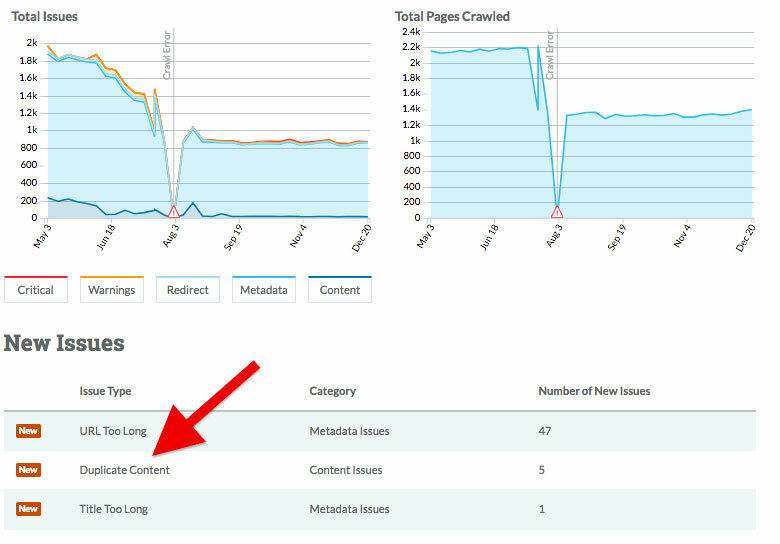 Get rid of duplicate content by using online tools like the Moz crawl test. Moz will send you weekly issues that may be damaging your site so you can rewrite page content so it is unique. This on page SEO tactic may seem challenging, but it is well worth it long-term. 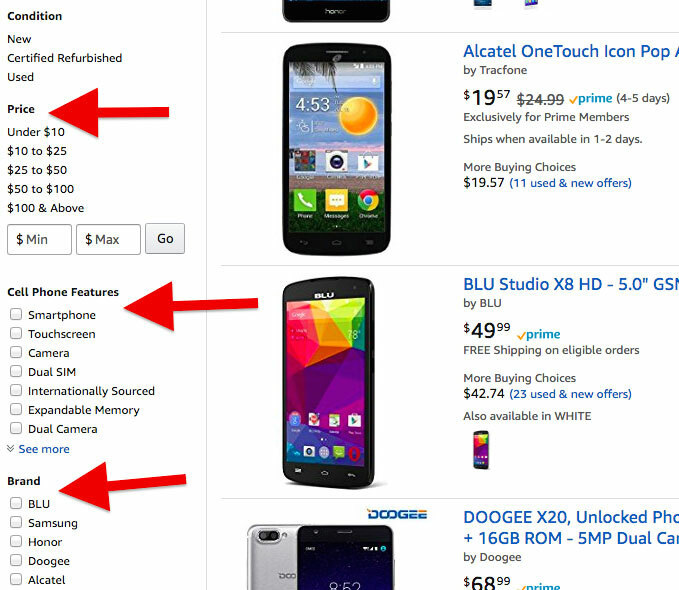 Unique title tags are powerful, but often difficult for large scale e-commerce sites. You most likely have products that are very similar and without thought just developed a title that is one-size fits all. However, you need to make your on page SEO a priority to overtake your competitors in ranking. Creating unique titles for product pages is one way to accomplish this because you help search engines understand your pages better and fulfil searcher intent. Optimised titles could follow this model . 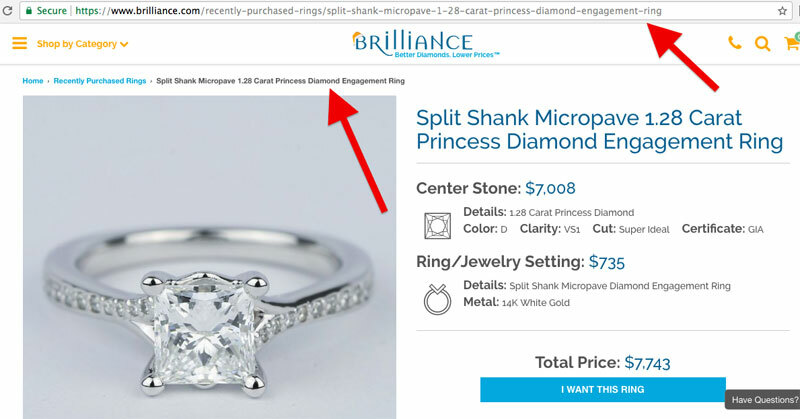 . .
For instance, large scale e-commerce site Brilliance sells a variety of jewellery that is very similar in item types, material, size, but keep their product SEO title tags unique . . . Ensure that your product SEO title tags are unique. 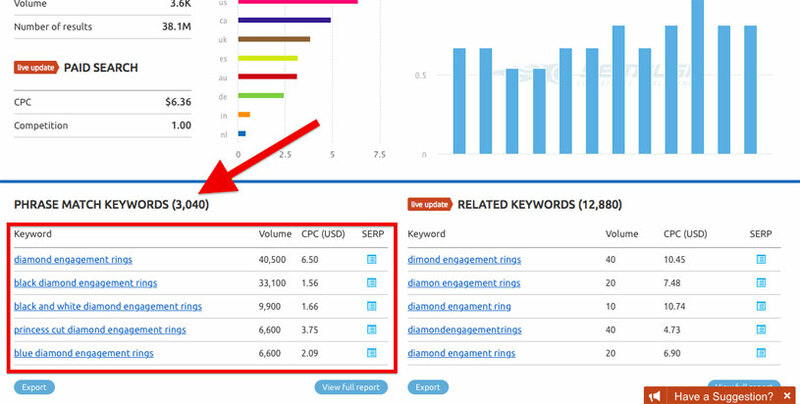 You can utilise online keyword tools like SEMrush’s Phrase Match to find unique keywords to place in your product page titles. One of the biggest on page SEO mistakes many large scale e-commerce sites make is not optimising product images. Product images can help online consumers find your products in “image search” and also add extra keyword value to your pages. Product image optimisation is an important on page SEO tactic since many consumers make buying decisions on images. 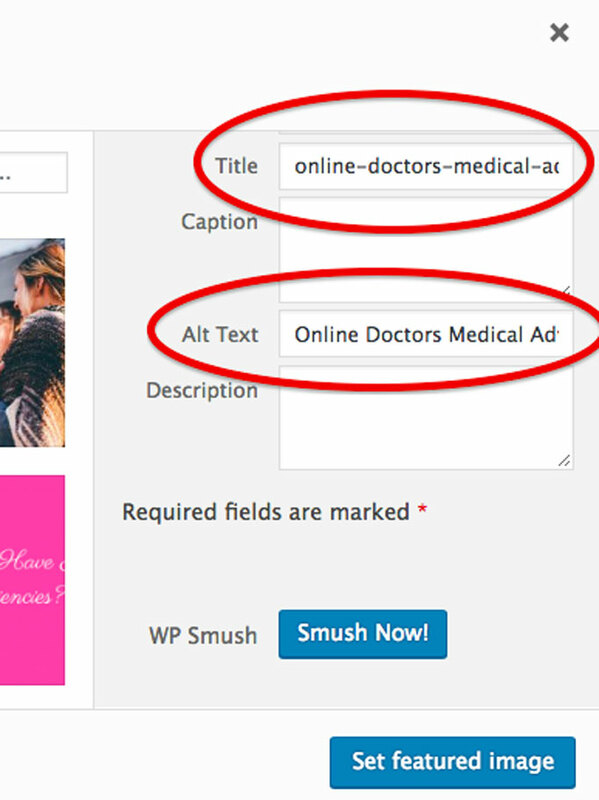 To get your images in front of as many potential customers as possible place your main keywords in your image Alt Text. To help more customers find your website, ensure that your main keywords are in your product image’s alt text. First, label the product image file prior to uploading it like . . .
Once uploaded, add the appropriate Alt Text without the hyphens like . . . Think of the Alt Text as if you were writing a label of an image for a friend. It will be more natural and remains a valuable way to increase your online visibility. On page SEO is a highly useful way to rank higher and drive more traffic to your large scale e-commerce site. 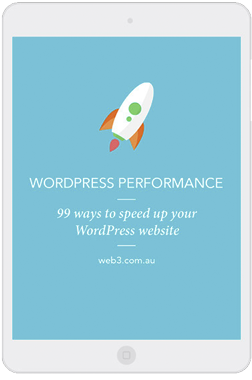 Even the smallest changes could drive hundreds of more visits a month per optimised product page. Your site is massive, but don’t forget the basics of search engine optimisation. Also, the better on page SEO you implement, the less you need to spend on Pay Per Click ads. You also serve up a powerful user experience that drives those much earned conversions. How will you make on page SEO part of your success in 2018? Nick Rojas is a business consultant, self-taught entrepreneur, and established writer for top publications such as Entrepreneur, TechCrunch, and Yahoo. He writes about topics to help business owners thrive including marketing, social media, and technology.